Stamped sterling silver rectangle shape bolo with two free form turquoise stones and a large leaf. 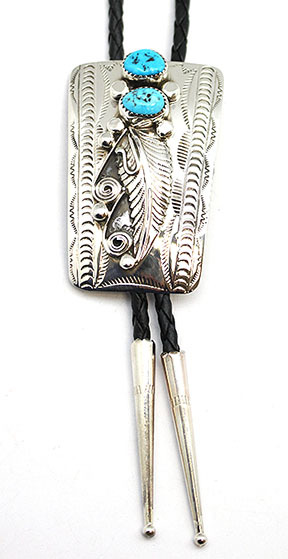 It has a vinyl cord measuring approximately 44'' long end to end with sterling silver bolo tips. Bolo itself measures approximately 2 1/4" long by 1 1/2" wide at the top and tapers down to 1 1/4" wide. Crafted by Navajo artisan Wilber Myers. Size and shape of stones will vary as well as stamped design.